Do you need your garage door replaced fast? We offer high-quality, efficient service when you need garage door repair in Arlington Heights. Our company is dedicated to serving customers who have dents, dings and all types of damage to their garage doors. We work around the clock to make sure your garage door is repaired as soon as possible. When your garage door cracks or breaks, your home’s security and weather resistance is compromised. You need professionals who can diagnose the problem and offer cost-effective solutions immediately. That’s exactly what we’ve been doing for over thirty years. The right garage door can add curb appeal and value to your home. 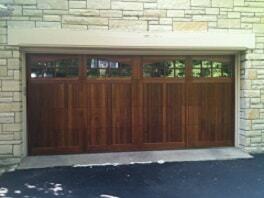 The superior garage doors we install will fit perfectly into your vision for your home’s design. Maybe your garage door couldn’t withstand the harsh winters north of Chicago, or it took a beating because of a vehicle accident, our team of knowledgeable professionals is ready to provide you with top-notch garage door repair in Arlington Heights. We immediately respond and show up on time. We examine your garage door’s damage. You can review your accurate, complete estimate. Our garage door specialists start work as soon as you say the word. Call our team any time and we can begin fixing your garage door damage right away. Your garage door is a central part of your home – it is another main pathway into your house. You wouldn’t want your front door to be cracked or damaged, and you definitely don’t want that for your garage door either. If your garage door or garage door opener is broken or malfunctioning, we’re on the job. It’s the reason why we’ve had so many satisfied customers for the past three decades – our work ethic and professionalism makes us the premier Arlington Heights garage door repair company. We pride ourselves on putting our customers first, 100% of the time. Call us today and get your free garage door repair estimate. “I was very stressed out when our garage door broke and when I called Overhead Garage Door Inc., Amber L. did a wonderful job of calming my nerves.” – Sandee O. “Paul R.’s knowledge of your company’s products was quite impressive, to say the least.” – Sean H.
“I wasn’t quite sure why our garage door would not open. Tom C. figured it out after just a few minutes of examination and made the repairs within an hour. Great job!” – Crosbie L.